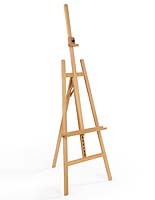 This Wooden Easel is Equipped with Rubber Stop Feet for Extra Stability! Three Simple Steps is All it Takes to Piece Together the Holder! Add Class to Your Framing with This Wooden Easel! Natural oak finish coordinates with any setting. Tray area provides display platform or is ideal for the placement of chalk or writing utensils. 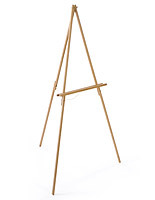 This lightweight wooden easel is constructed from sturdy and attractive hardwood with a natural oak finish. This floor display stands 64" high and can hold various sized boards, graphics, artwork and signs. The natural finish allows the painting or signage to be the main focus and not the tripod. 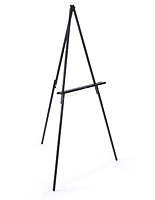 The lightweight design makes this wooden easel easy to store away whenever necessary. This wood tripod folds into a compact, flat design that doesn't consume a lot of storage space. This wooden easel is ideal for restaurants and businesses that need a temporary stand to display a sign or welcome greeting. 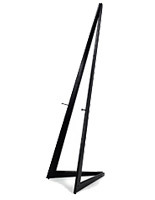 This competitively priced floor stand has proven to be very popular in a short time. 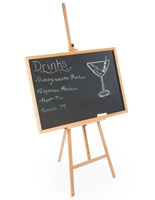 This wooden easel makes a great addition to any hotel, conference center, university, school or office. Artists can use this simple wood stand to hold a painting or work in progress. This wooden easel ships unassembled. The assembly process takes a matter of minutes and can be completed by one person. 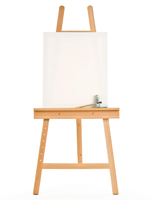 Each wooden easel includes a narrow tray that can hold small paint brushes while creating a masterpiece. The bottom of each leg features a rubber foot that helps to keep the floor stand stable, and not mark any delicate floor surfaces. 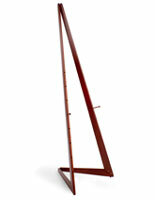 Purchase this wooden easel for your office to display a favorite painting or family portrait. The display possibilities are endless with this simple tripod stand. 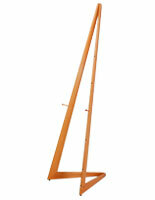 This wooden easel ships the same day when ordered by 1pm EST weekdays! 21.4" x 64.3" x 31.3"
21.4" x 64.5" x 4.5"